That's Macho Grubba. He's Grubba all souped-up on Crystal Star power. Max HP is 60, Attack is 4, and Defense is 0. His attack pattern is simple: first he increases the number of times he can attack... Then he powers himself up with all sorts of crazy, power-uppy moves. So, it's pretty important to pay close attention to how he's powered himself up. The craziest thing about this musclehead is that he used to be that chubby Grubba. I guess the Crystal Stars really ARE powerful! 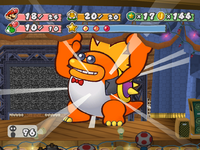 Macho Grubba is the powered-up form of Grubba, also the true chapter boss of the Glitz Pit in Paper Mario: The Thousand-Year Door, and keeper of the real Gold Star. In this state, he has sixty HP (which is shared by Dark Clubbas in Super Paper Mario), and also has a very wide variety of attacks. After being defeated, Grubba's power-sucking machine goes off, returning energy to Bandy Andy and KP Pete, freeing Prince Mush, and reverting Grubba back to his normal form. He is also one of two chapter bosses not affiliated with either Sir Grodus or the Shadow Queen throughout the entire game (the other being Cortez). He is also one of four chapter bosses the Yoshi Kid can swallow, The others being Doopliss, Grodus and the Shadow Queen (first phase, before and after transformation). After being powered up by the Gold Star, Macho Grubba has the ability to tilt the scales in battle to his favor. At the beginning of the fight, Macho Grubba gains the ability to attack twice per turn. By doing this, he can inflict more damage on Mario and his partner in one turn, or even upgrade his status to a more powerful state during this time. Another ability Macho Grubba has is to increase his attack power as well as his defense. With an increased attack power, Macho Grubba's attack power will go up by three, bringing his overall attack to seven. Should he increase his attack power more than once, he can bring his attack up to ten, and even thirteen. 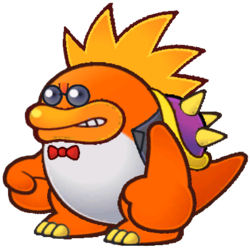 Depending on which attack Macho Grubba uses at the time, he can inflict damage on both Mario and his partner, doubling the effects of his upgrade. By increasing his defense, his defense will go up by two. This makes it more difficult for Mario and his partner to damage Macho Grubba. Macho Grubba can also increase his defense multiple times, bringing his defense up to four, and even five — which is the highest numerical defense in the game. In addition to being able to increase his attack, he can also charge up his attack by four. Should his attack be at thirteen, and then be increased by four, his attack will be brought to a devastating seventeen, the highest possible attack Macho Grubba can have and one of the highest attack power in the game. When low on health, Macho Grubba will also make himself dodgy, making it much more difficult for Mario and his partner to inflict damage on Macho Grubba, if at all. "Hoo-wee! I'm gonna smoosh you guys into guacamole an' snack on YER energy, too!" French Stéro Gangs Stéro is a diminutive of "steroids", Gangs is Grubba's French name. Macho Grubba is one of two bosses in the game to show signs of being worn out when he has low health, along with Sir Grodus. Like Rawk Hawk, Macho Grubba also fights in the manner of a heel character, which is a villainous wrestler who uses dirty, underhanded tactics to win. As stated by Macho Grubba, himself, he "had so many rump-kickin' moves they had to make some illegal. "; indicating he was, indeed, a heel. This page was last edited on August 30, 2018, at 10:20.